Baton Rouge has had their share of storm events, but new shoreline green infrastructure could help mitigate the impacts of future ones. Taewook Cha, ASLA, founding principal of SuperMass Studio, presented their landscape plan for the Water Institute. 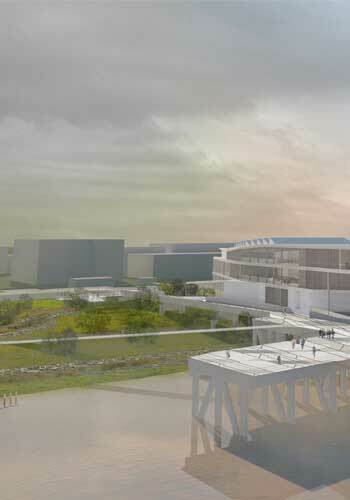 Built on the old city dock, the main campus building will be parallel to the main circulation corridor between the dock and city center. 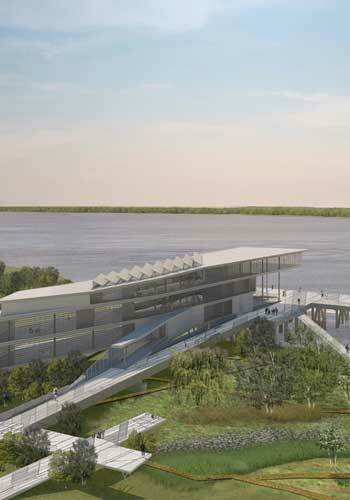 This orientation creates a physical and symbolic connection to the Mississippi River. 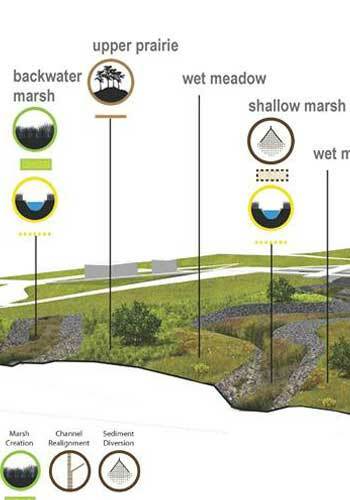 Along the opposite side of the throughway, SuperMass will recreate six distinct coastal-riparian ecosystems: coastal wetland, floodplain forest, wet meadow, shallow marsh, upper prairie, and backwater marsh. These constructed ecosystems will provide a range of services. They will protect the shoreline and structures, stabilize the banks, help restore the ridges, divert sediment, and enable the creation of new marshes and channels. These new systems will provide stormwater and flood management while creating new wildlife habitat. At Rockaways beach in New York, the devastation of Hurricane Sandy is still fresh; the community won’t soon forget. The old wooden boardwalk there was torn apart by storm surges that turned the wooden planks into destructive projectiles that destroyed homes along the shoreline. In response, the New York City Parks and the Department of Design and Construction have rebuilt areas with concentrated amenities, and then filled in the stretches along the five-mile long shoreline. Future boardwalks will be made from concrete and recycled plastic lumber so they don’t splinter. The U.S. Army Corps of Engineers has been dredging sand from the ocean floor to build massive sand berms between homes, boardwalk, and beaches to protect the community from the next Sandy. Ecologically-appropriate vegetation will be planted both along the boardwalk and the berms themselves. In addition, concrete pavers, designed with a neat wave pattern that made the audience say “whoa!,” will allow bike access for the first time. 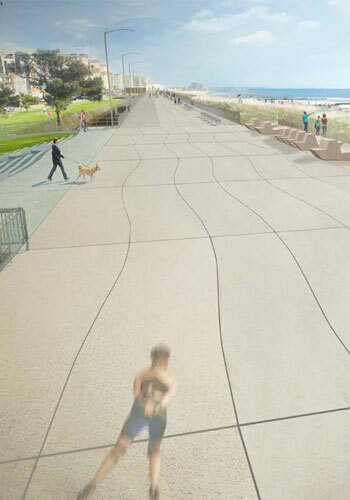 Ramps will allow beach access over and down the berms. The project will be built over the next two years with federal funds, at a cost of somewhere between $200 and $260 million. 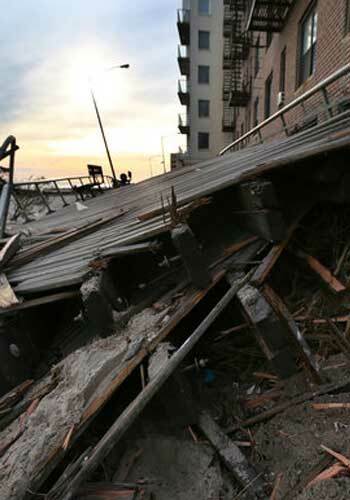 Should another storm surge hit Rockaways hard, much of the sand will again be wiped out. But the boardwalk is high enough above the surge line that sand will be swept out from under it. The concrete infrastructure should be left intact, avoiding the projectile damage caused during Sandy. Doesn’t look very people friendly to me.